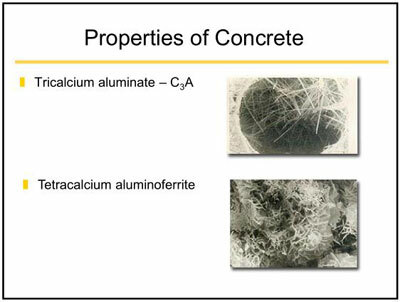 Concrete is an artificial conglomerate stone made essentially of Portland cement, water and aggregates. 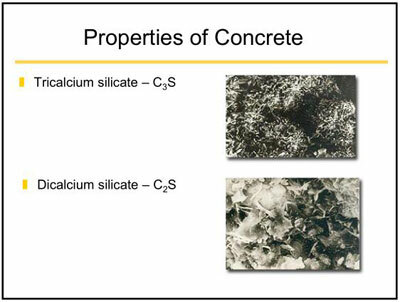 While cement in one form or another has been around for centuries, the type we use was invented in 1824 in Britain. It was named Portland cement because it looked like the stone quarried on the isle of Portland. 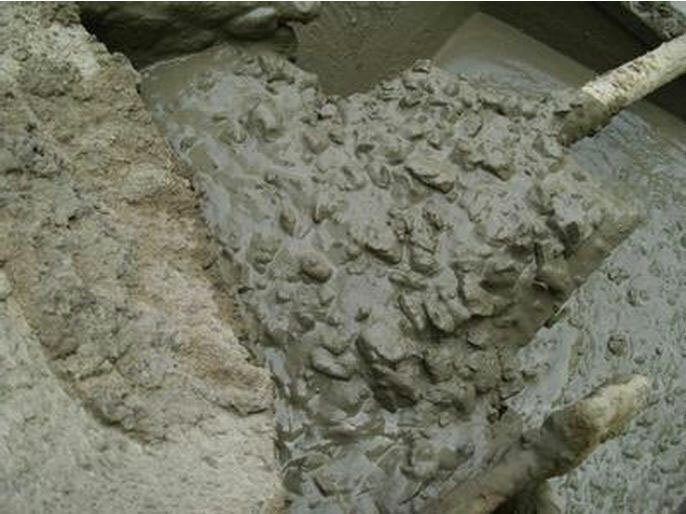 When fixed mixed the water and cement constitute a paste which surrounds all the individual piecec of aggregate make a plastic mixture. 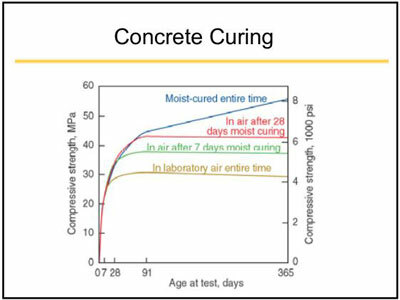 Concrete continues to gain strength as it cures. 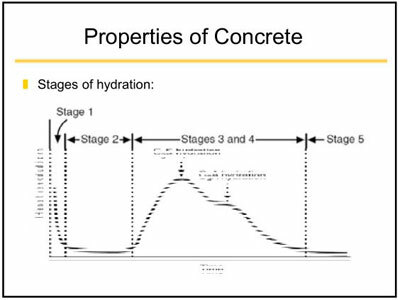 Heat of hydration is the heat given off during the chemical reaction as the cement hydrates. 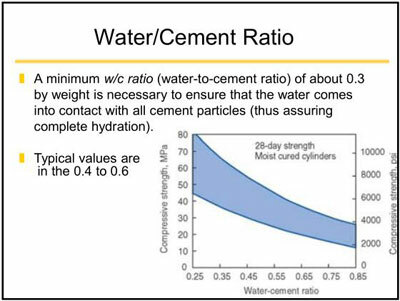 The single most important indicator of strength is the ratio of the water used compared to the amount of cement (w/c ratio). 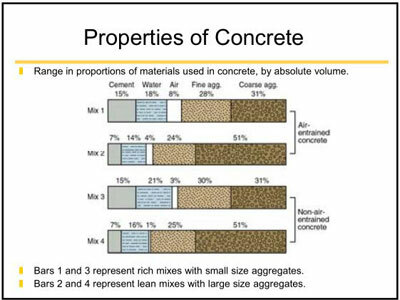 Basicallthe lower this ratio isthe hiher the final concrete strength will be. This concept was developed by Duff Abrams of The Portland Cement Association in the early 1920s and is in worldwide use today. 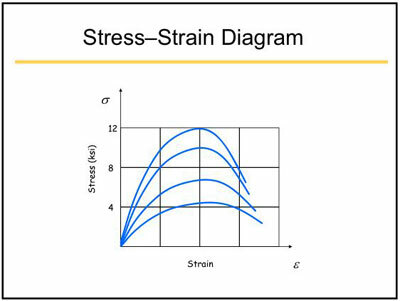 Compressive Strength – is defined as the measured maximum resistance of a concrete or mortar specimen to an axial load, usually expressed in psi (pounds per square inch) at an age of 28-days. 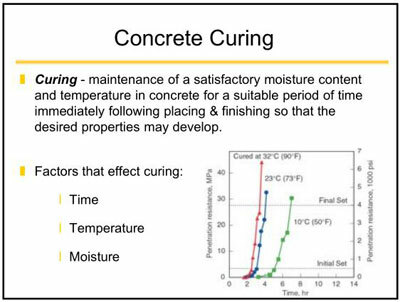 During the first week to 10 days of curing it is important that the concrete not be permitted to freeze or dry out. In practical terms, about 90% of its strength is gained in the first 28 days. 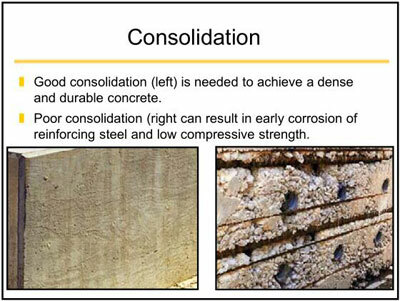 Concrete compressive strength depends upon many factors: quality and proportions of the ingredients; the curing environment. 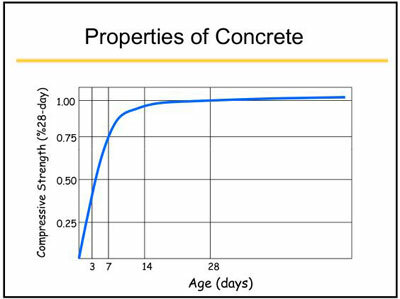 Concrete used in structures and pavements is expected to have long life and low maintenance. 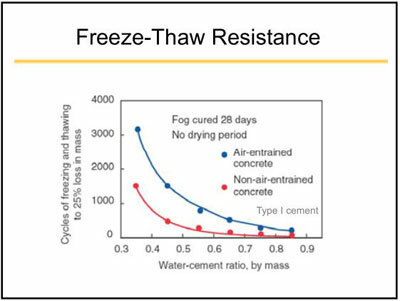 It must have good durability to resist anticipated exposure conditions. 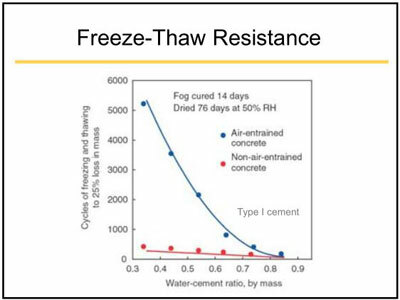 The most potentially destructive weathering factor is freezing and thawing while the concrete is wet, particularly in the presence of deicing chemicals. 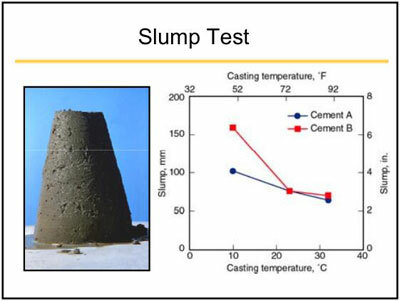 Deterioration is caused by the freezing of water and subsequent expansion in the paste, the aggregate particles, or both. 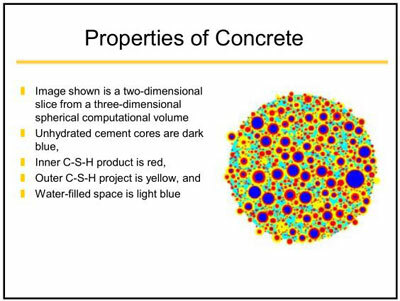 The ingredients of concrete can be proportioned by weight or volume. The goal is to provide the desired strength and workability at minimum expense. 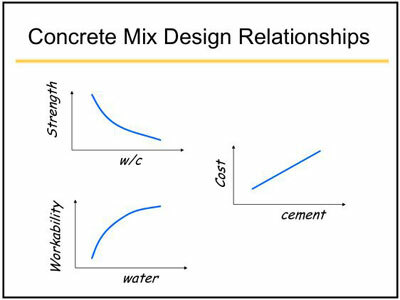 A low w/c ratio is used to achieve strong concrete. 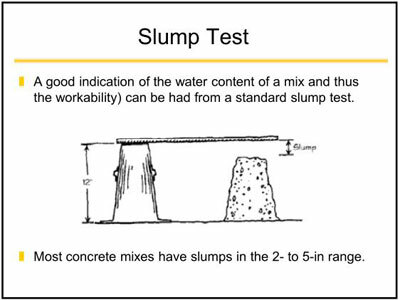 Could you increased the cement content and use enough water for good workability and still have a low w/c ratio. 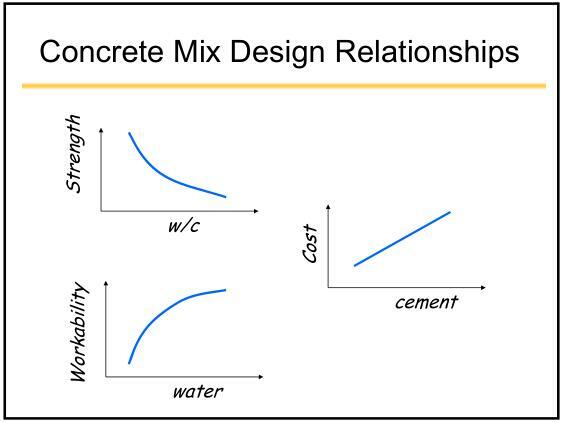 Workability – that property of freshly mixed concrete that determines its working characteristics, i.e. the ease with which it can be mixed, placed, compacted and finished.